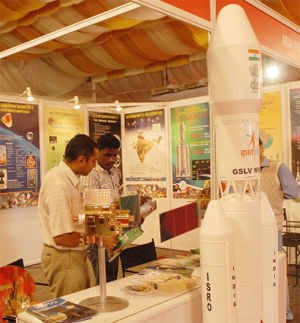 Isro announced that it will test the crew module and escape systems on a Geo-synchronous Launch Vehicle-MK III (GSLV-MK III) during 2014-15. BANGALORE: India's hopes of sending humans on a spaceflight to demonstrate its technological advancement is moving in the right direction with Isro starting the instrumentation process in a crew module structure. It will test crucial re-entry aspects, key to bring the craft back into the earth's atmosphere and land at a designated spot. Isro, which had announced that it will test the crew module and escape systems on a Geo-synchronous Launch Vehicle-MK III (GSLV-MK III) during 2014-15, has already obtained its first 'crew module structural assembly'. A senior official from the space agency said: "The structure is in Thiruvananthapuram and our team has begun the process of instrumentation, likely to be completed in four to six weeks." Hindustan Aeronautics Limited (HAL) had delivered the 'crew module structural assembly' to Isro earlier this month. "The instruments that need to go in are those related to crew support, navigation, guidance and control systems and so on," the official said, adding that the agency will not be testing life support system crucial for any manned mission this time. "We will not be testing the life support system for the crew in the launch scheduled sometime in May-June. The payload will only be for the crew module testing and the re-entry of the payload," Isro spokesperson confirmed to TOI. Another official said the agency is in a parallel manner developing a specialized parachute, which will be instrumental in bringing the crew module back safely. "Once we direct the payload to return home, we will need a parachute to hold it post re-entry and land it safely," he said. Crew modules and escape systems form an important aspect for the proposed manned mission, which is yet to get complete clearance from the Centre. But Isro has got permission to begin initial studies, which are progressing well, with a re-usable technology demonstrator already ready. Isro chairman K Radhakrishnan said the testing will be done on experimental flights of GSLV-MK III. Following the testing of various technologies in the coming years, beginning with the crew module test scheduled in May-June 2014, Isro will near the ambition of undertaking a human spaceflight mission to carry a crew of two or three to Low Earth Orbit (LEO) and return them safely to a predefined destination on earth. Upon successful testing of the crew module, the space agency will commence testing of the life support system, environmental control and crew escape system.